I wrote last week about the value of getting lost in a strange city and the benefits of B&Bs. This week’s post continues my thoughts on a travel experience that really connects you with your destination and its people. I highly recommend walking tours offered by local students or retirees. Rick Steves directs you to these sorts of tours in his excellent travel guides. These folks are a wealth of stories about their homes towns. Just talk to people in general. If you’re not naturally a friendly person, force yourself a little out of your comfort zone; that’s what travel is for. My French is pretty bad, but one evening at a fruit market in Paris, I noticed a fruit that I’d never seen before, and managed to point and ask “Qu’est-que c’est?” and the owner gave me handful of the loveliest, sweet little yellow plums to try. Naturally, I ended up buying a whole bag of them. In Rome and Paris, we got to know some of the regulars by going into the same coffee shop every morning. In Ireland, just by opening conversations with people, we made so many new friends. We met a Greek physician and learned all about the lingering effects of the financial crisis in Greece. We met an American expat who drove into the Wicklow Mountains with us to show us the best spot for viewing the mountains and Guiness Lake. Walking to dinner through a park one evening, we missed the Early Bird Special because we stopped to pet someone’s dog and got into a half hour conversation with him about his own travels. We treasure these moments of connection as much as our photographs of the lovely scenery. My final plea is to learn something ahead of time about the area or country you are about to visit. If you are going to a place where you don’t speak the language, get the Rosetta Stone and learn just a bit. Read the history and literature of the country. You will make surprising connections and enrich your understanding of other places that you’ve visited and your own home. Reading Les Miserables while in France helped me to understand why there is a Victor Hugo Street or Victor Hugo café in every French town, big or little. And when I noticed an O’Connell Street in every Irish town, I had a hunch that O’Connell must have had something in common with Hugo – and that turned out to be right. Although Hugo was a writer and O’Connell was a politician, both of them earned the undying devotion of their countries simply by loving the common people so deeply. So, please go away. Go away in your own country or abroad. Go away on a tour, or wing it as I’m advocating. But, by all means, please go away. You will be so enriched by it. No lie. Some of the most interesting experiences we had on our recent trip to Ireland involved liars. The barfly who wove an incoherent tale about “helicoptering” his whole family to Brittany one Christmas. The pub owner who claimed to be the real Kitty O’Shea. The very drunk woman who insisted that we had to come home with her and see her “castle.” The even drunker Frenchman who made up a song about my husband’s PNC windbreaker, and then when he found out PNC was a bank informed us that he would never work for a large corporation and he was actually on his way home to France to start a revolution. I generally avoid extravagant liars and the noisy, crowded bars where you tend to meet them. But you haven’t really experienced Ireland unless you’ve spent several evenings in pubs where you hear both wild music and wild tales. And that’s what I’m advocating for in today’s post: not so much drunkenness, wild music or wild tales, but the experience of doing what you don’t usually do. There’s a kind of travel where you see sights that you expected to see and learn the things that you expected to learn and do the things that you expected to do, and feel entertained and satisfied and are never upset or confused or uncomfortable, and that kind of travel is just fine. But, I’d like to challenge my readers to try a way of travelling that I think is even better. Packaged tours are expensive and tend to insulate you from the country you are visiting and especially from its people (other than the ones who want to sell you something). I’m advocating being brave and going it on your own. Yes, you will be lost and confused sometimes, but when you are lost and confused, you have to engage with the natives. Contact with local people is what I‘m most passionately advocating We went the B&B route for the first time on our Ireland trip, and I will do it whenever possible in the future. Without exception, our hosts were warm and helpful. Our hosts in Kinsale were an elderly couple with two tiny, naughty dogs and a home cluttered with souvenirs of their own trips, photos of their large family, cards from their many guests over the years and ribbons from seemingly every gift they ever received hanging on the doorknobs – not so very different from many working-class retirees in the U.S. They were happy to share with us the story of their house, its history as a bakery for the nearby fort and their experience in acquiring and remodeling it. In next week’s post, I will share some additional thoughts on a fully-engaged travel experience. Having absorbed the assumption that Christianity in Europe is moribund at worst and merely historical at best, I didn’t have high spiritual expectations for any of the churches we visited in Ireland. By the time we got to Galway, we had been to Christ Church Cathedral, the Rock of Cashel and Saint Multose, and tried and failed to see Glendalough Abbey (no parking spots open anywhere within 2 kilometres). All interesting from a historical standpoint, but we were kind of churched-out by the time we got to Galway and we almost didn’t go into St. Nicholas Collegiate Church. But what surprised and attracted me had nothing to do with 14th-century stone carvings and everything to do with 21st-century activity. This was the first European church we’ve walked into that felt alive in the present to me. The first thing I noticed was that the church ladies were running a little café inside the sanctuary. Almost every seat was taken, mostly by locals, chatting and resting after shopping in Galway’s Saturday-morning open-air farm market. 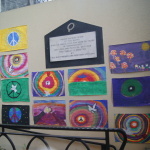 The second thing I noticed was the children’s art work – not hung in an entryway with the coats and umbrellas, but right in the sanctuary alongside the 16th-century baptismal font and the tomb of a 15th-century mayor. The third thing I noticed was flowers – absolutely everywhere in this church. On the altar. Beside the altar. Filling an ancient holy water stoup. In stands beside pillars. In pots on the floor. In front of the WWI memorial cross. 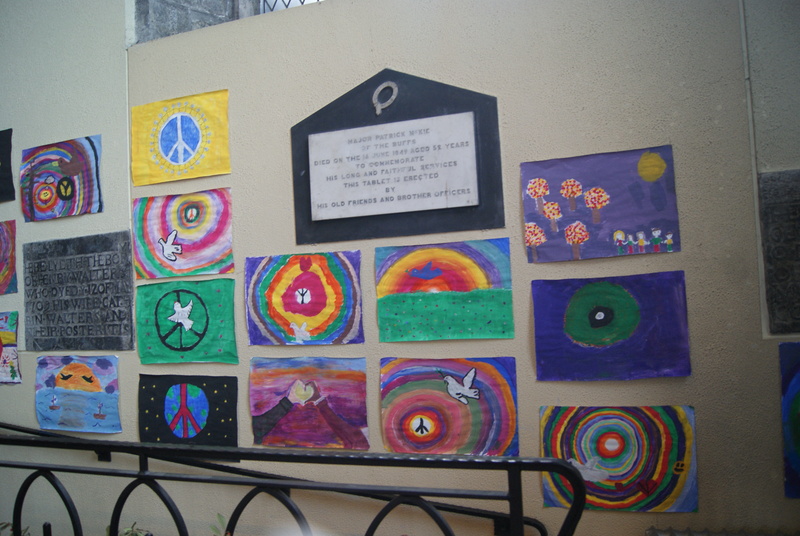 In front of, in and around the little side chapel. Under the windows. The flowers, the artwork, and the friendliness of the café created such an atmosphere of joy that we just had to sit down and partake of the coffee and pastries for only 4 euros, and get into a nice chat with the rector’s wife. This charming lady, a liberal Christian after my own heart, described their Sunday School program and the concerts where they have to place extra chairs right on top of the floor tombs of medieval worthies, and their Harvest Festival donations to the food bank. And I thought: Oh, wait, right. It isn’t about the buildings after all. They will all be ruins eventually, and there will still be no such thing as the “post Christian era” in any meaningful way. Our Lord lives in hearts, not in buildings, hearts like the ones so evident at St. Nicholas on that windy Galway Saturday, and like the ones in our own beloved home church, Zion Lutheran. I already knew that, of course. But the benefit of travel isn’t just that you come back with photos of the Eiffel Tower or the Cliffs of Moher. It’s that it shakes you out of your complacency, and causes you to question your own received wisdom. Sometimes you come away from that experience with a new wisdom, but sometimes what you come away with is a deeper, sweeter understanding of things that you knew all along. There are 186 cathedrals in France, and about 4000 smaller churches, not counting the ones that are mere jagged ruins along the highways. From Chartres and Notre Dame of Paris to squat, plain-fronted little chapels in Alsatian wine villages, they are weighted with a dim, sooty sense of history that is lacking in our red-brick American churches with their modern circular naves and abstract strained glass. What they lack is the bustle of American churches. Other than during Mass times, a French church will probably be empty of anyone except a few grandmothers and ragged men on their knees – and, of course, tourists. Only about 12% of French citizens report attending Mass weekly. The big cathedrals in cities like Paris and Strasbourg are immaculately maintained by the state as cultural treasures, but the little churches in country towns suffer from leaky roofs, rusting iron statues – and empty pews. 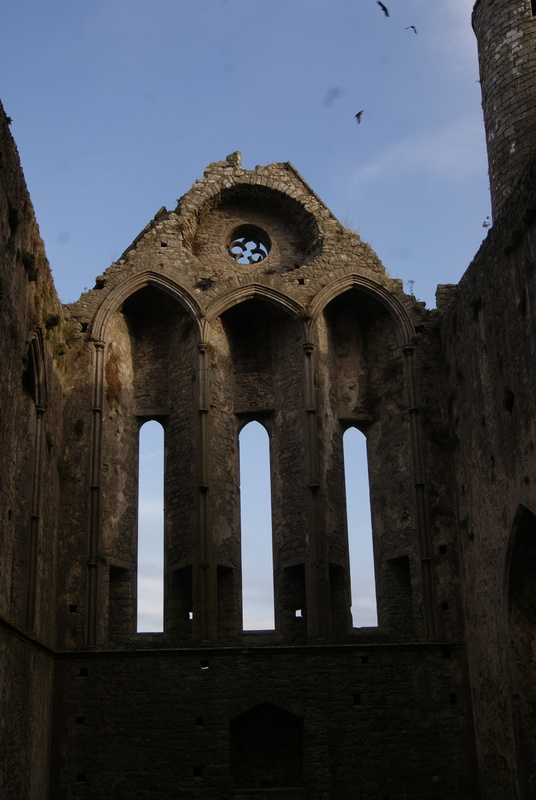 And you can hardly turn around in Ireland without encountering the skeleton of an abandoned church or monastery. Most of that is the result of Ireland’s unfortunate history, of course. First the Anglo-Normans closed the Celtic Christian monasteries and imposed their own hierarchical, rule-bound version of Catholicism on Ireland. Then Henry VIII closed the Anglo-Norman monasteries, and finally Cromwell’s armies came along and burned any Catholic church that was in their path (with the people still in them, on at least one occasion). Most of those skeletons have been slowly crumbling for a long time. Still, there is no escaping the stark fact that church attendance even in devout Ireland, though still among the highest in Western Europe, fell from about 85% to 60% between 1975 and 2004. I couldn’t help wondering what that means. 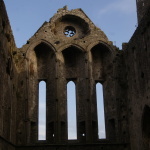 In my novel The Saint’s Mistress, I dealt with the many reasons for the rise of the Christian church in Europe, from its ability to fill the power vacuum left by the collapse of the Roman Empire, to the attraction for women of a religious authority that frowned on abortion and infanticide and made a mission of caring for the poor, the sick and the widowed. My own belief is that the fundamental reason for the rise of Christianity is that it is true. But what does that then say about its decline in the West? I was disturbed by the thought that Europe, at least, seems to be living in a post-Christian era. We live now in the era of Google and Apple and Nike and General Electric. The West has gained so much in the past 200 years, but I wondered about what we have lost. Does God still live at all in the beautiful places that people built in our striving towards Him? Does He live in those crumbling, abandoned little country churches in France? What does it mean that our ancestors invested in cathedrals and we invest in office buildings and resort spas and 6000-square foot McMansions? Part of the answer came in a surprising place: a 14th-century church in Galway, Ireland, where I expected to find only history. To be continued…..